Last month we looked at a room that needed help but was not a big challenge. So as promised, now we get to look at my mess. 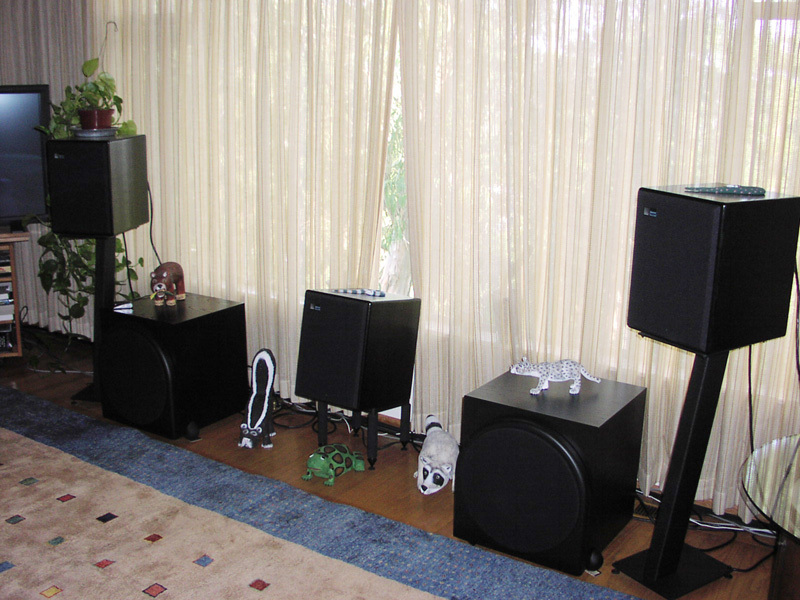 I’ve been in this house for about 13 years and the system has evolved from large stereo speakers to small, stand mounted stereo speakers, to a 5.1 setup with five Meyer Sound Labs HD-1s and two Revel B-15s for the LFE channel. While I like to watch movies, my primary focus is music. So for me, the speaker placement took precedent over everything else. It was important to have a setup that conformed to the same standards by which I tune studios. At the same time, when my girlfriend moved in, I had figure out a way to make some compromises without sacrificing the sound to any degree. 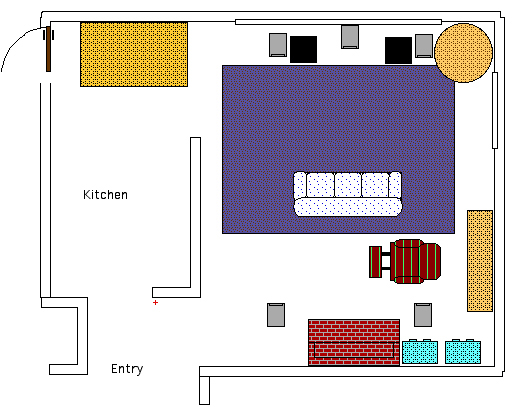 Let’s look at the floor plan for my room (Figure 1). I have a living room that has open doorways next to the left front and left surround speakers. There is a small window on the right wall towards the front. A brick fireplace sticks out into the rear of the room. My ceiling slopes up from the front picture window side (8’11”) toward the fireplace (10’4”) at about seven degrees. All of the front speaks back up to the large picture window. I also have a center speaker that sits at the same height as my left/right speakers. Regrettably the center speaker sits right in the middle of the living room picture window and blocks the view (Golden Gate Bridge). That doesn’t float well with my girlfriend but luckily at my house, it’s “love me, love my speakers”. I know that is not a workable attitude in the real world and we’ll look at how I overcame my problems (room and girlfriend) below. I chose to set the front speakers up on the picture window side for various intuitive reasons, which ended up being confirmed by measurements. A) If I wanted to take advantage of the sloping ceiling, the window wall made sense. Seven degrees is a good angle to send the first order ceiling reflections into the back of the room. Setting up on the fireplace side (my girlfriend’s choice) meant that the ceiling reflections would be directed at the listener. You always want the wall or ceiling angle to pass signal away from you, i.e. narrow in the front, wide in the back. B) The window wall also had a possibility of allowing some of the speakers rear firing low frequency energy to pass out of the house, thus eliminating loading, and out of phase reflective energy. My speakers were designed to be flat in free space, so I took this into account. C) Both the window and fireplace walls have the same disadvantage in that there is only one full corner due to the walkways, which results in non symmetrical bass response. D) The right side wall had an advantage since it has two full corners. But I was a bit concerned about the fireplace sticking out 30 inches, which could create bass problems for the right front speaker. Setting up on the right side wall also meant that the ceiling would be at different heights for all of the speakers, not very symmetrical. And then there was the simple fact that, esthetically, the furniture setup would have been just plain weird (ignoring both the view and the fireplace). D) For future consideration, speakers on the window wall gave me the longest throw and more ceiling height if I ever mount a projector on the ceiling in the back. The above reasoning for placement was then double checked by analysis. Remember that I’m a room tuner and have the advantage of good measurement gear, which allows me to fine tune the speaker placements. Without bursting your bubble, getting the speakers in the proper spot in a room like this would be quite difficult and time consuming to do by ear. I started with the window wall since I felt that was going to give me the best results. I actually ended up finding a couple of fairly decent spots for the left and right speakers (fig. 2). My methodology was the same as I described in Sound Advice 1, experimenting with speaker and listener positions until I could close in on a solution. It’s quite a bit easier using an analyzer though. When you move the speaker or listening position on an axis, you get immediate feedback on what frequencies are affected and whether or not you are heading in the right direction. Remember my girlfriend’s desire to have the speakers on the fireplace wall? I decided to measure that wall next for a couple of reasons. 1) It would make her happy. 2) It meant that mounting my 50” plasma above the fireplace would be real cheap and simple. 3) Esthetically, it works for the room. 4) I knew that I could easily treat the ceiling for the first order reflection problems. Well, much to our disappointment, the bass response totally sucked (and was sucked out) on that wall. I just could not find a good speaker/listener combination that gave me even an acceptable frequency response. Why? Remember that this acoustic stuff is only part science and that there is an element of voodoo. But basically, the dimensions just worked against us. The differences between the window and fireplace walls are ceiling height and the fireplace itself, so my intuition turned out to be correct. The above measurements also spelled doom for the right side wall since the ceiling height and fireplace had the same effect on the right front speaker for that layout. If I were to give this a go without measurements, my best guess would be to try the following. Utilizing the RPG Room Optimizer program, I would first find the front right speaker position since it has a real corner behind it. 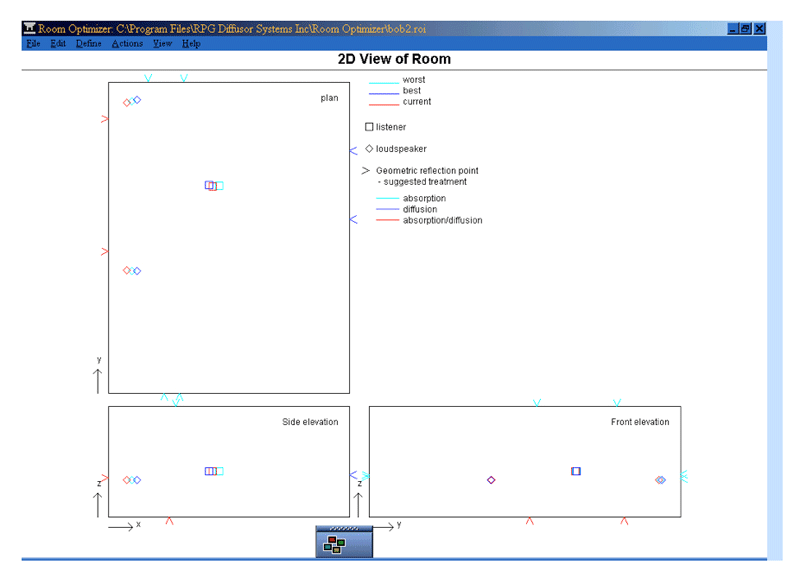 I would restrict the listening position in the Y-axis (width) to keep the listener centered in between the right and left living room walls. I would use the distance between the far kitchen wall and right wall as the Y-axis dimension since both speakers will travel that path and the opening to the kitchen is fairly wide. That ignores the tangential reflections for the left speaker, but hey, I said I’m guessing here. I’m also throwing out the fact that the ceiling has a seven degree slant, but I figure that the bass wavelengths are long enough that it won’t have a huge effect. I would use the ceiling height above the speaker for the Z-axis. So essentially I asked the program to give me a non-symmetrical set up. I decided to run it and see what happens (fig. 3). Well, I’m only halfway into this and I’ve totally exceeded my space. See, non-symmetrical rooms are really difficult. No easy fixes. So we will finish this up in the next article.